The Northern Himalayan crags near Badrinarayan are still blessed by the living presence of Babaji, guru of Lahiri Mahasaya. The secluded master has retained his physical form for centuries, perhaps for millenniums. The deathless Babaji is an avatara. This Sanskrit word means “descent”; its roots are ava, “down,” and tri, “to pass.” In the Hindu scriptures, avatara signifies the descent of Divinity into flesh. The Upanishads have minutely classified every stage of spiritual advancement. A siddha (“perfected being”) has progressed from the state of a jivanmukta (“freed while living”) to that of a paramukta (“supremely free” — full power over death); the latter has completely escaped from the mayic thralldom and its reincarnational round. The paramukta therefore seldom returns to a physical body; if he does return, he is an avatar, a divinely appointed medium of supernal blessings on the world. An avatar is unsubject to the universal economy; his pure body, visible as a light image, is free from any debt to Nature. The “Moon of Delight who know’st no wane” is God, eternal Polaris, anachronous never. The “Moon of Heav’n rising once again” is the outward cosmos, fettered to the law of periodic recurrence. Through Self-realization the Persian seer had forever freed himself from compulsory returns to earth: the “garden” of Nature or Maya. “How oft hereafter rising shall she look after me — in vain!” What frustration of search by a wondering universe for an absolute omission! Babaji’s mission in India has been to assist prophets in carrying out their special dispensations. He thus qualifies for the scriptural classification of Mahavatar (Great Avatar). He has stated that he gave yoga initiation to Shankara, reorganizer of the Swami Order, and to Kabir, famous medieval master. The chief nineteenth-century disciple was, as we know, Lahiri Mahasaya, revivalist of the lost Kriya art. 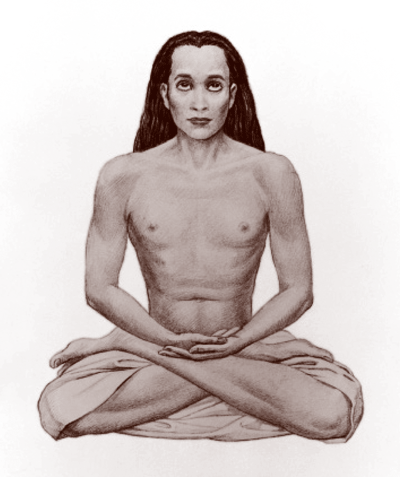 Babaji is ever in communion with Christ; together they send out vibrations of redemption and have planned the spiritual technique of salvation for this age. The work of these two fully illumined masters — one with a body, and one without a body — is to inspire the nations to forsake wars, race hatreds, religious sectarianism, and the boomerang evils of materialism. Babaji is well aware of the trend of modern times, especially of the influence and complexities of Western civilization, and realizes the necessity of spreading the self-liberations of yoga equally in the West and in the East. Great prophets like Christ and Krishna come to earth for a specific and spectacular purpose; they depart as soon as it is accomplished. Other avatars, like Babaji, undertake work that is concerned more with the slow evolutionary progress of man during the centuries than with any one outstanding event of history. Such masters always veil themselves from the gross public gaze and have the power to become invisible at will. For these reasons, and because they generally instruct their disciples to maintain silence about them, a number of towering spiritual figures remain world-unknown. I give in these pages on Babaji merely a hint of his life — only a few facts that he deems fitting and helpful to be publicly imparted. No limiting facts about Babaji’s family or birthplace, dear to the annalist’s heart, have ever been discovered. His speech is generally in Hindi, but he converses easily in any language. He has adopted the simple name of Babaji (Revered Father); other titles of respect given him by Lahiri Mahasaya's disciples are Mahamuni Babaji Maharaj (Supreme Ecstatic Master), Maha Yogi (the Great Yogi), and Trambak Baba or Shiva Baba (titles of avatars of Shiva). Does it matter that we know not the patronymic of a fully released master? The deathless guru bears no mark of age on his body; he appears to be a youth of not more than twenty-five. Fair-skinned, of medium build and height, Babaji’s beautiful, strong body radiates a perceptible glow. His eyes are dark, calm, and tender; his long, lustrous hair is copper-colored. Sometimes Babaji’s face closely resembles that of Lahiri Mahasaya. On occasion the similarity was so striking that Lahiri Mahasaya, in his later years, might have passed as the father of the youthful-looking Babaji. Swami Kebalananda, my saintly Sanskrit tutor, spent some time with Babaji in the Himalayas. “The peerless master moves with his group from place to place in the mountains,” Kebalananda told me. “His small band contains two highly advanced American disciples. After Babaji has been in one locality for some time, he says: ‘Dera danda uthao.’ (‘Let us lift our camp and staff.’) He carries a danda (bamboo staff). His words are the signal for moving with his group instantaneously to another place. He does not always employ this method of astral travel; sometimes he goes on foot from peak to peak. “Babaji can be seen or recognized by others only when he so desires. He is known to have appeared in many slightly different forms to various devotees — sometimes with beard and moustache and sometimes without them. His undecayable body requires no food; the master, therefore, seldom eats. As a social courtesy to visiting disciples, he occasionally accepts fruits, or rice cooked in milk and clarified butter. “Two amazing incidents of Babaji's life are known to me,” Kebalananda went on. “His disciples were sitting one night around a huge fire that was blazing for a sacred Vedic ceremony. The guru suddenly seized a burning brand and lightly struck the bare shoulder of a chela who was close to the fire. “‘Sir, how cruel!’ Lahiri Mahasaya, who was present, made this remonstrance. “On another occasion Babaji’s sacred circle was disturbed by the arrival of a stranger. He had climbed with astonishing skill to the nearly inaccessible ledge near the guru’s camp. “The man immediately hurled himself over the cliff. Babaji instructed the shocked disciples to fetch the stranger’s body. After they had returned with the mangled form, the master placed his hand on the dead man. Lo! he opened his eyes and prostrated himself humbly before the omnipotent guru. An avatar lives in the omnipresent Spirit; for him there is no distance inverse to the square. Only one reason, therefore, motivates Babaji in maintaining his physical form from century to century: the desire to furnish humanity with a concrete example of its own possibilities. Were man never vouchsafed a glimpse of Divinity in the flesh, he would remain oppressed by the heavy mayic delusion that he cannot transcend his mortality. Jesus knew from the beginning the sequence of his life; he passed through each event not for himself, not from any karmic compulsion, but solely for the upliftment of reflective human beings. The four evangelists — Matthew, Mark, Luke, and John — recorded the ineffable drama for the benefit of later generations. During my visit at Ranbajpur with Ram Gopal, “the sleepless saint,” he related the wondrous story of his first meeting with Babaji. “I sometimes left my isolated cave to sit at the feet of Lahiri Mahasaya in Banaras,” Ram Gopal told me. “One midnight as I was silently meditating in a group of his disciples, the master made a surprising request. “I soon reached the secluded spot. The night was bright with moonlight and the glittering stars. After I had sat in patient silence for a while, my attention was drawn to a huge stone slab near my feet. It rose gradually, revealing an underground cave. As the stone became stationary, held up by some unknown means, the draped form of a young and surpassingly lovely woman emerged from the cave and levitated high in the air. Surrounded by a soft halo, she slowly descended in front of me and stood motionless, steeped in ecstasy. She finally stirred, and spoke gently. “A nebulous light was rapidly floating over the Ganges; the strange luminescence was reflected in the opaque waters. It approached nearer and nearer until, with a blinding flash, it appeared by the side of Mataji and condensed itself instantly into the human form of Lahiri Mahasaya. He bowed humbly at the feet of the woman saint. “Before I had recovered from my bewilderment, I was further wonder-struck to behold a circling mass of mystical light traveling in the sky. Descending swiftly, the flaming whirlpool neared our group and materialized itself into the body of a beautiful youth. I understood at once that he was Babaji. He looked like Lahiri Mahasaya; though Babaji appeared much younger than his disciple, and had long, bright hair. “Lahiri Mahasaya, Mataji, and I knelt at the great guru's feet. An ethereal sensation of beatific glory thrilled every fiber of my being as I touched his divine flesh. “‘I have already glimpsed your plan, beloved Master. I wanted to discuss it with you tonight. Why should you leave your body?’ The glorious woman looked at him beseechingly. “As I listened in awe to the conversation between these exalted beings, the great guru turned to me with a benign gesture. “As the sweet melody of Babaji’s voice faded away, his form and that of Lahiri Mahasaya slowly levitated and moved backward over the Ganges. An aureole of dazzling light surrounded their bodies as they vanished into the night sky. Mataji’s form floated to the cave and descended; the stone slab came down and closed over the cave, as if moved by invisible hands. “Infinitely inspired, I wended my way back to Lahiri Mahasaya’s place. As I bowed before him in the early dawn, my guru smiled at me understandingly. “My fellow disciples informed me that Lahiri Mahasaya had not moved from his dais since my departure at midnight. “‘He gave a wonderful discourse on immortality after you had left for the Dasaswamedh ghat,’ one of the chelas told me. For the first time I fully realized the truth in the scriptural verses which state that a man of Self-realization can appear at different places in two or more bodies at the same time. Yoganandaji helped an artist to draw this true likeness of the great Yogi-Christ of modern India. Mahavatar Babaji has refused to reveal to his disciples any limiting facts about his birthplace and birth date. He has lived for many centuries amid the Himalayan snows.